You can adjust the warning period before events. Changing the notification period does not affect pending events that have already displayed their notification. By default only users with administrator rights can cancel events. Enabling this check box allows all users to cancel any pending event. You should restart after changing this check box. The management of the cancel right is delegated to the authorization services in Mac OS X. A restart is required to ensure the change is propagated to all users. Hopefully this requirement will be removed in future editions of Mac OS X. By default only users with administrator rights can delay events. 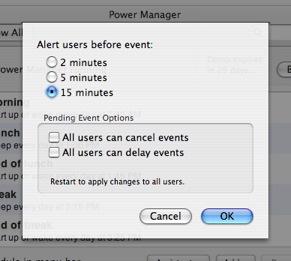 Enabling this check box allows all users to delay any pending event. The management of the delay right is delegated to the authorization services in Mac OS X. A restart is required to ensure the change is propagated to all users. Hopefully this requirement will be removed in future editions of Mac OS X.